I just wanted to thank you all for the past year! I really appreciate your support to World of Cigars. 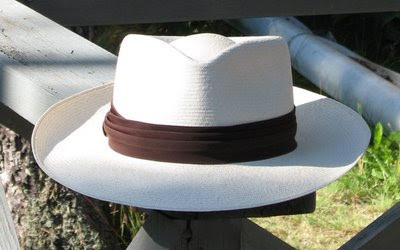 Despite and due to the current global financial turmoil truly hope, that next year will be profitable for you all, and that together we can continue supporting the cigar industry and the good life. Something was terribly wrong with this cigar. I do not know, if this review is going to give the full picture of the CAO Maduro Belicoso, and i will have to revisit it as soon as i can, but i will review it rather sooner than later anyway. As you know, many factors are essential to a full experience of a good cigar, and if any of the factors is a miss, then the experience can be most unsatisfying. This is what happened with my CAO Maduro. Do, not get me wrong here. I enjoyed it to an extend, but to get to the enjoyment part, i had to face some serious obstacles. First "fragrance" rising from the cigar was unmistakably manour. Nothing more, nothing less, just manour. I had to think twice wether or not i should light up the cigar at all. The CAO Cameroon L'anniversaire Belicoso is one of the few box pressed cigars i have smoked in a long time. Somehow, i prefer the round shape. The pressed ones just do not sit so well on my fingers. Blame the fingers. Anyway, the cigar is very beautiful. The veinless wrapper shines in golden leather colours and the rolling and construction seem to be almost flawless. And that really shows and feels in the draw and burn. Flavourwise, the CAO Cameroon Belicoso is a great cigar. It has a certain "honesty" in its essence. On the milder side, the cigar offers some profound earthy flavours, combined with a sideline of spices. Toss in the sweet tastes of caramel and roasted sugar and there you have it. Nicely balanced, interesting cigar, with enough character and depth to receive a high score. Similar to the Sopranos edition from CAO, the tobacco used in the MX2 is from all around. In addition to the Conneticut wrapper, the binder comes from Brazil and the filler from all over Central America. This should give the cigar complexity and depth, but once again, the different leafs with different charachteristics seem to dissapear behind one layer of simplicity. The medium bodied MX2 Beli is a good, well balanced cigar, with an earthy profile with tones of dark chocolate and espresso - familiar flavours for maduro lovers... The cigar also has a nice spicy touch. The overall flavour profile did not develope much after the spicy beginning smoothing down when reaching the half way mark. From that point forward, the cigar had a very generous creamy feel to it. A decend smoke that needs a lot of spare time due to its monstrous size. For that, not an everyday smoke. You probably cannot smoke and review any CAO Sopranos cigar without some expectations of what to come. I know I already created a clear picture of the Robusto sized Associate cigar inspired by its name and appearance only. However, what came as a surprise to me, was that the image in my head did not fully go together with the true nature of the cigar. In a local magazine, Mr. Olli Alho described the wrapper to be "as dark as a hitman's soul", and indeed, it is a fair picture of the mentality of the TV series Sopranos. However, that is where the similarities between the series and the cigar end, atleast in my view about them both together and separately. As mentioned before, the wrapper is very dark brown with a beautiful golden hue to it. 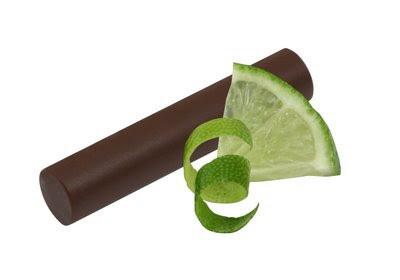 The cigar feels great in the fingers and the unlit, sweet chocolate and tobacco fragrance makes your mouth water. What the cigar loses in a slightly uneven burn, it gains in great draw, good looking ash and generous white smoke. 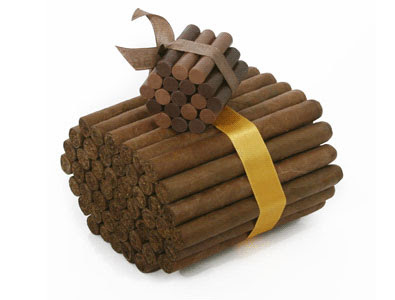 What comes to the flavours of the cigar, it could be much more complex. 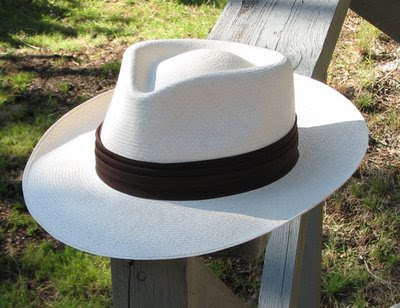 Although the tobacco leaves used as wrapper and filler are from all over the map, they do not succeed in giving all their potential depth and variety into the blend. The blend is balanced, in the sense, that no flavour becomes overpowering in any stage of the cigar, but all in all it is a simple and straight forward in taste. All along the way, the cigar is sharing out sweet tobacco, coffee and chocolate flavours. 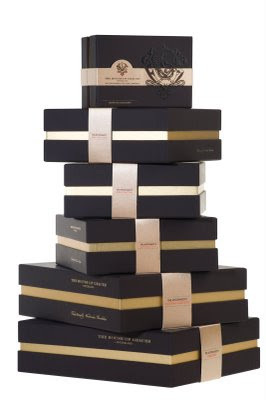 I think there is no better time to write and review some luxury chocolates, than now, Christmas on our door step, just asking permission to enter our prepared homes. 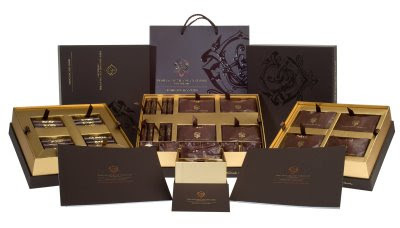 What makes this write up even more enjoyeable, is that the chocolates made by House of Grauer have been made for enjoyment with quality cigars. This unique concept combines two things i love profoundly. According their own words, Grauer chocolates are an online revolution for cigar aficionados. Grauer House has created the concept of "chocolate and cigar pairings" based on a very simple idea, namely that the pleasure of smoking should not be limited to the universe of the cigar. When enjoyed together, chocolate and cigars bring out the very best in one another. With each mouthful you will experience a new alliance, and your palate will discover an unsuspected world of harmony. 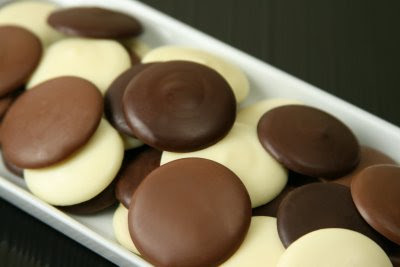 The chocolates themselves are produced by hand according to the tradition of Swiss chocolates, using traditional techniques but modern recipes. 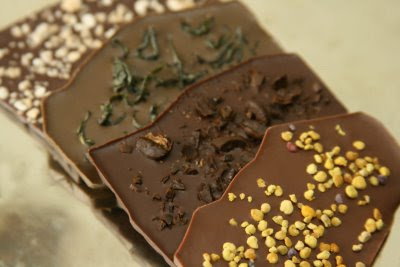 Each different type of chocolate has their distinctive character build up from the high quality ingredients carefully picked to create an unique composition of taste, appearance and texture. The philosophy behind the Aficionado's Collection is to create new sensations together with the characteristic flavours from the cocoa bean and the tobacco leaf. The aim to create a harmony between the flavours and to offer something more - a new experience through the balance of the two products. Online, House of Grauer presents their carefully selected pairings and gives guidance on how to select the right chocolate for the right range of flavors in a cigar. In all simplicity, you can order your chocolates online, delivered within 48 hours worldwide, then go to your humidor, pick your favourite cigar, check out the pairings on the web to choose a suitable chocolate and finally enjoy the extended experience. The selection of chocolates is wide, and i have to say, they are all exquisit! From all the different flavours and pairings i tried with the small sampler provided, i found two over the others. 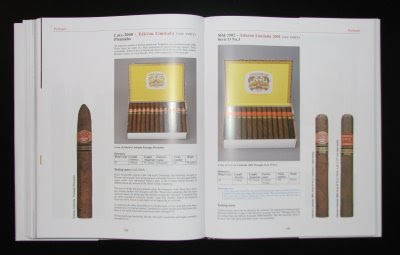 I myself, did not take the pairing guidance from the pages as given, and went with cigars i thought had some of the characteristics described there rather than blindly going with the suggestions. I will not go into describing every different chocolate, as they are all unique, and you might as well go to http://www.grauerchocolates.com/ and try them yourself. All in all, I highly recommend the experience. 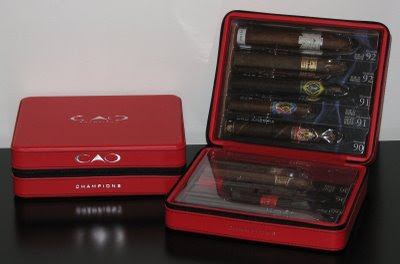 What comes to the CAO Vision Prana individually, I dare to say, that i enjoyed it tremendously. From the first moment of seeing the cigar and smelling its unlit vanilla fragrance to the last draw and the 2nd degree burns on my fingers, i simply thought the cigar was exceptional. The draw is loose but not too so, and if anything, it just offers a generous amount of white smoke with a medium body. 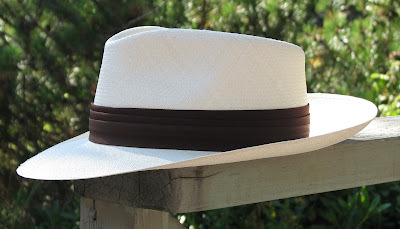 The cigar has a cedary profile with leather and vanilla notes. At first, it seems that the cigar will not grow complex, but then flavours of sugar roasted nuts and something which resembles fresh baked bread step into the picture. Half way through, the flavours intensify, the nutty flavour taking more room and bringing along a creamy finish with fruity edges. The CAO Vision Prana is a well balanced and complex cigar, that will not dissapoint anyone. Even the burn was perfect all the way. I really did not want to put this one down. There was no sign of any bitter or harsh flavours in any point. Full pleasure. Next time i will smoke a CAO Vision Prana, will be after a delicious Sushi meal. I Can't wait. Arganese ML3 Robusto - What to write about this one? The question arises to me, as with this, i have to balance between the overall quality and the performance of the cigar, and the personal preferences of flavour and my "Nordic Palate". To start with, the ML3 has a nearly black Brazilian Maduro wrapper, and although it has a beautiful oily shine to it, i just do not consider cigars this dark to be beautiful. The unlit aroma is excellent. Full of dark chocolate, cocoa bean and sweet tobacco. Luckily, the sweet chocolate flavours show up in the smoke too and through the somewhat tight draw, notes of cocoa and espresso are noticable. What next appears, is that the cigar is a little too sweet and a little too juicy with the maduro profile to suite my taste. 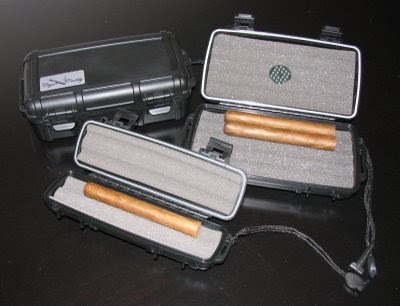 On other hand, i assume, this cigar will do great on the US market. After the half way mark, the exotic and "bloated" body of the ML3 smoothens down to give way to some woody and grassy flavours with a hint of acidity, and that finally leads to a bitter finish. The ML3 could go great with a light Lager or Ale beer, but on its own, it is a little too exotic for me. I also had to go and correct the burn a few times while smoking, which i did not like. Despite it few flaws and its America targeted profile, i tend to think the ML3 Robusto is a good cigar. It is just not ment for my (or the Finnish) palate. The Nigaraguan Figurado from Arganese Cigars is a beautiful cigar. It is expertly rolled and has a stunning, brown wrapper with a bronze shine. 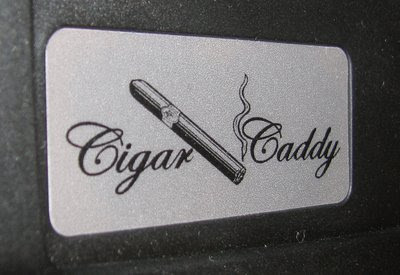 The cigar feels good in your hand and gives away a strong, full fragrance unlit. The burn is a little off at times, but corrects itself with no problems. The draw begins a little tight, but loosens up in a little while. And as the draw corrects itself, generous flavours of rich, sweet tobacco and coffee notes become obvious. This full bodied smoke lends some characteristics of the Cuban Maduro cigars - It has the same dark feel to it. What the cigar wins in the generous, dark power it loses in complexity. Over all, the cigar does not develope significantly along the way, some hints of chololate or cocoa can be detected though. Oils and tar gather t the tapered end of the figurado, giving it an even more intense flavour in the end. Although the flavours fill the palate completely, it remains smokable and enjoyable until you burn your fingers. Highly recommendable. The Arganese CL3 was one of the smokes of ASH2008. As such, i heard a lot of opinions from the quests and they were all positive. The CL3 is "to the third power", which stand for the triple ligero construction of the cigar. 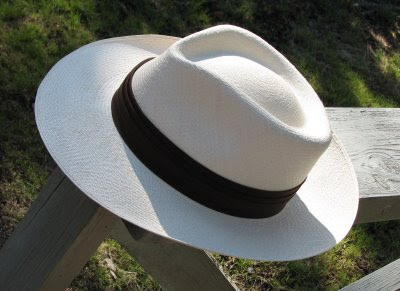 It is rolled from 100% First Generation Cuban Seed tobacco, trying to reach the "Cuban Profile". The wrapper is a little uneven in color, but a treat for the eye non the less. The cigar feels quite hard but gives you a perfect draw. From the first draws, it is clear, that the CL3 carries a lot of power and character. The full bodied smoke offers a spicy and leathery profile with hints of nuts and cedar. The finish is somewhat dry. The hard character of the powerful tobacco and spiciness mellow down half way through, but do not think, that the intensity would diminish. This cigar gives its all to the very end. At the very end, the flavours turn a little papery though. In the end, the CL3 is a skillfully rolled and a great tasting cigar, which maybe does not offer you the world, but does not dissapoint you either. A good choice for an after dinner smoke. This is just to give you all a heads up on the new part of my realm. After the year is over, i will be revisiting all the cigars reviewed during the past year and will be awarding them in different categories. All the details are not clear yet, but will be, when it is time for the awards. I will work hard to get all possible samplers sent to me before 10th of December to fit in this year's awards, but i have a few waiting for reviewing already. 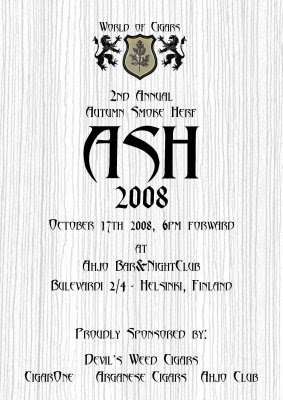 The 2nd annual Autumn Smoke Herf - ASH 2008 - took place on October 17th at the Ahjo NightClub, Helsinki, Finland. After last years informal and relatively small gathering of a few friends, this year's event grew larger and more robust in all areas. Over 25 lovers of the leaf and the good life, gathered to enjoy fine cigars, drinks and the company of similar minds. Most of the guests represented Finnish Cigar Clubs i.e. Robaina Club and the Cigar Club of Lahti. Cigar lovers from the Moskow Cigar Club brought an international aspect to the else so Finn based group of guests. In addition to the widening range of participants, what really made this year's event special, was its charitable nature. Together with the generous sponsors, we managed to raise 600 Euros. Not bad, as my goal was to gain only half of that (due to the non-commercial nature of my operations). The income was built up by selling cigars, drinks and apparel live at the event. Every Cent donated, will go directly to the Children's Hospital of Helsinki, my personal choice of charity. The cigars were provided by Cigar One, Arganese Cigars, Devil's Weed Cigars, JS Cigars, Finest Cuban Cigars and Me personally. Drinks, in addition to the venue free of charge, were provided by Ahjo Bar&NightClub. The apparel was donated by Spreadshirt. Thank you all for your generosity! I truly appreciate it! All in all, I had a good time. According to my guests, they had a great time, we smoked and tried out some excellent cigars, enjoyed fine cognacs and celebrated the night away. And we managed to do some good at the same time. 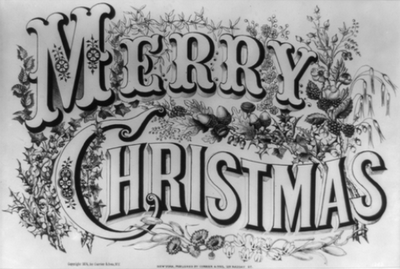 online shops to the previously named charity. 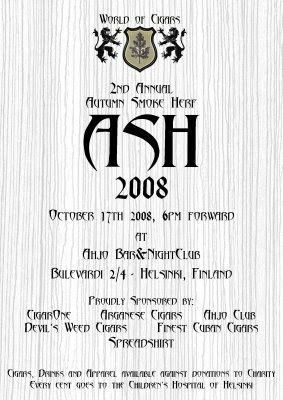 Unfortunately, due to the Finnish legislation, there will be no 3rd annual Autumn Smoke Herf at the Ahjo Club. The continuance on the permit to smoke in some restaurants will end on June 1st 2009. Our only hope, is to gain an access and/or establish a private club, at which the art of cigar smoking could take refuge after the feared date. We'll see, if there will be something similar in the spring, but i do not have any plans for that. If anyone has any solutions, please, let them be heard! If you have any questions or need for more information, please do not hesitate to contact me through the "contact me" tab on the navbar. 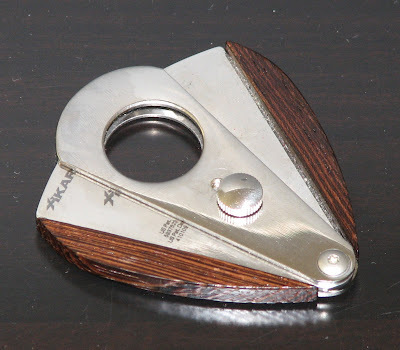 The Xi3 double bladed guillotine cutter by Xikar is a great example of design and engineering. 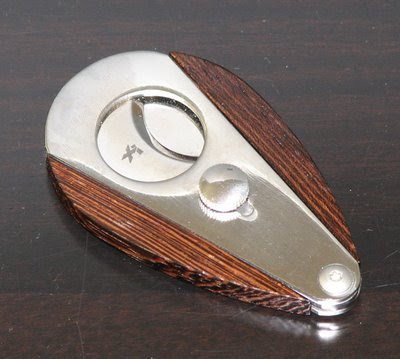 It looks great, especially the zebrawood on the shiny steel. The mechanism of the blades is ingenious, but combined with the sleak form, it can be a little tricky to handle. A tleast, it requires a little time to get used to. 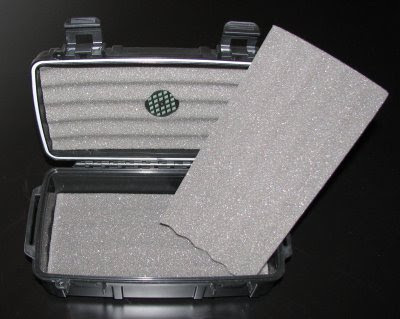 I have heard a few cases, where the wooden parts have come of, when dropped on the floor, but otherwise, the Xi3 seems to be safe and sound to use even in a rough spot. It feels solid to your hand, and gives you the feeling you are using your whole hands to cut instead of just your fingers. Partly from the solid structure, rises the singe downside to this cutter. The blades, although extremely sharp and extremely powerful, are somewhat too thick and can cause pressure on the cigar. The pressure causes the cigar to give in just enough to possibly crack the wrapper and ruin the cigar. I have seen this only on a very few occasions, and it can as well be a result of something entirely different reason. 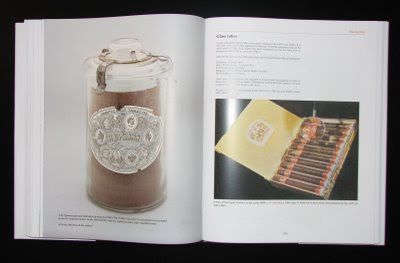 The Illustrated Encyclopaedia of Post-Revolution Havana Cigars is often referred as the "cigar bible", and is very much true to this name. It's author, Min Ron Nee, is undoubtedly one of the few true Aficionados of Cuban cigars, and happens to own one of the most amazing collection of Habanos on this planet. 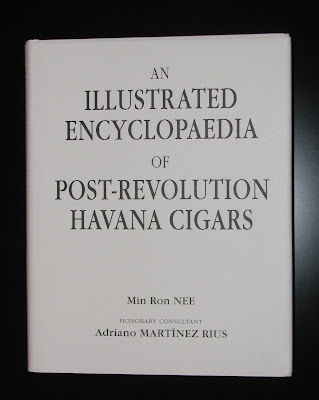 Thru his wide knowledge of probably every single Cuban cigar out there, Min Ron Nee has put together an extremely wide study on the post-revolution production of Habanos and related subjects. He has described the characteristics of every cigar, and even discussed the aging potential and profile, as difficult a task that can be with published information lacking beforehand. What goes for the book itself, the printing is flawless, pictures are beautiful, and the materials premium. 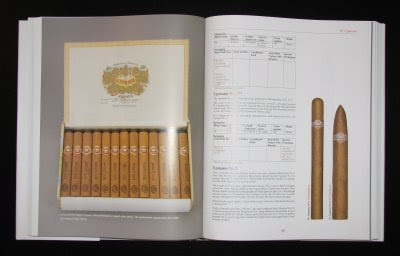 All in a coherent and a concise form to give you an next to perfect reference guide to the world of Habanos. "The beauty of this world is that everybody has different beliefs, opinions and preferences. It does not matter at all whether yours are the same or different to mine." I was fortunate to have my dear friend David Haegens at La Casa de Puros provide me with the copy reviewed here. My point being: Get your copy and enjoy!